Atmosphere is a huge part of why people go out to eat at a restaurant. Within your restaurant, the color scheme, décor, menu design, and even the background music should all blend together in a way that represents your brand and creates a memorable experience for your customers. All too often, owners and managers neglect the audio element of atmospheric design in their restaurant. They let their employees choose music from their phones, put on Pandora, or shuffle popular songs, unaware that they’re missing out on a valuable opportunity to influence their customers behaviors. Multiple studies have been done on the influence music has on consumers. Louder, fast paced music causes consumers to eat faster and spend less time in your restaurant, which can increase table turnover. If your goal is to increase the average check size, then soft, slow paced music can get consumers to stay longer. Genre can affect how much consumers are willing to spend. With the presence of classical music over top-40, consumers spend more on wine. The right playlist can cause your customers to behave in ways that help increase check size, increase table turnover, and create an overall better experience. Your music selection shouldn’t just be limited to these factors, however. It’s also important to select music that’s specific to your brand. In this post, we’ll discuss in detail how to put together a playlist that’s right for your restaurant. A common problem among small business owners is that many of them are using music illegally and don’t even know it. As a result of expensive copyright lawsuits from music licensing organizations, many of these restaurants need to shut down. Even if you’re using a music streaming service like Pandora, you may be at risk of being sued for copyright infringement on the songs that have been played in your restaurant. This makes sense – the music copyright owners for the songs need to be properly compensated. To become compliant with copyright law in a way that lets you use any song you’d like in your business, you need to get licenses from the Performance Rights Organizations (PROs) BMI, ASCAP and SESAC (yes, all three). The reason you should get licenses from all 3 is because each organization represents different songwriters, and many times, a single song can have multiple songwriters. To save on music licensing fees, you could get a license from one of the organizations and only use songs written by the songwriters they represent, but this can make for a very time-consuming playlist creation process, as you’d have to look up the information for each songwriter in the copyright database, and the individual databases of the PROs. If you’d like to learn more about the details on how music licensing works, check out some of these music licensing questions. If you have a high-end restaurant, providing a classy experience involving live musicians might be a good option to consider. Expensive restaurants require attention to detail to justify the cost. This doesn’t just go for food, but also the design of your restaurant. Due to the quality of live music over that of a recording, live music can add an increased perception of attention to detail that recorded music just doesn’t get. Pulling this off can be difficult, as you may need to buy the instruments and sound equipment, as well as find talented musicians, but it can be well worth it if you want to go the extra mile. If you choose to go with live performers for your background music, you may still need to pay licensing fees to BMI, ASCAP, and SESAC if the performances consist of cover songs. If you’re fully compliant with copyright law and have a brand strategy in place for your restaurant, you’re ready to get started crafting your playlist. When building your playlist, you want to focus on a few different things. Let’s discuss them each in detail. The genre of music can have a huge impact on how consumers perceive your restaurant, and how much they spend on food and drink items. Certain types of music influence purchasing decisions by creating an atmosphere that increases the perception of value. For example, multiple studies, like this one, have shown that the presence of classical music causes consumers to spend more on high-end alcoholic drinks such as wine. Music can also influence our perception of taste. Softer music, like some forms indie rock or pop, can cause us to perceive certain flavors in a stronger way, while more intense music such as hip-hop and dance can have a negative affect on our ability to perceive taste. It’s most important that you choose a genre that goes well with your restaurants’ image. If you’re running a coffee shop themed around local art, music from local indie rock musicians is a great fit. The takeaway: Don’t just put on the top 40 hits playlist. Choose a genre that goes along with the style, culture, and theme of your restaurant. Volume and tempo can have a positive or negative affect on your restaurant, depending on how it’s used. Setting the music louder can help increase table turnover, but may give customers an unpleasant experience. Too quiet, and the diners aren’t influence by the music because they can’t hear it. Tempo, on the other hand, can affect our heart rate. With an increased heart rate, we tend to move faster. The best way to set the volume and tempo of the music is different depending on the time of day. If you’re in a slow period, setting the playlist to a low volume with slower songs may keep people in your restaurant and give you time to encourage them to buy desert or stay for an extra drink. During the dinner or lunch rush, turn the volume up and play some faster paced songs to increase table turnover so you can get new customers seated quickly. The takeaway: Adjust the volume and tempo of your music throughout the day to influence how much time customers spend in your restaurant. Usually, major key songs sound happy, perky, or enthusiastic, while minor key songs sound sad, mysterious, moody, or melancholy. When choosing what types of songs to play in your restaurant, it’s important to consider what emotional message you want your brand to deliver to your customers. It may seem like you’d always want to go with the major key (happy sounding) songs, but minor key songs have much more emotional intensity. Take the time to consider what sort of emotions you want your brand to convey, and choose music that compliments this message. The takeaway: Choose music that matches the emotional descriptions of your restaurants’ brand. The music playing in the background at your restaurant has an effect on people’s mood and even their decisions. 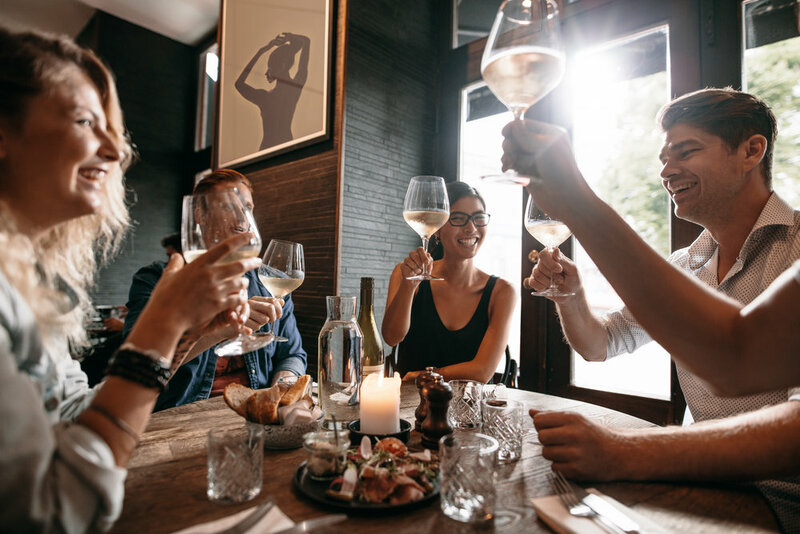 You want your customers to have a positive, memorable experience of dining with you and music can have an influence on this. Be conscious of the music you’re choosing for your restaurant and of course, make sure the songs you’re playing are legally sound as well. About the Author: Nick Rubright is the founder or Dozmia and guitarist for the band Days Gone By. He’s passionate about all things music and marketing, and writes to bring these together.